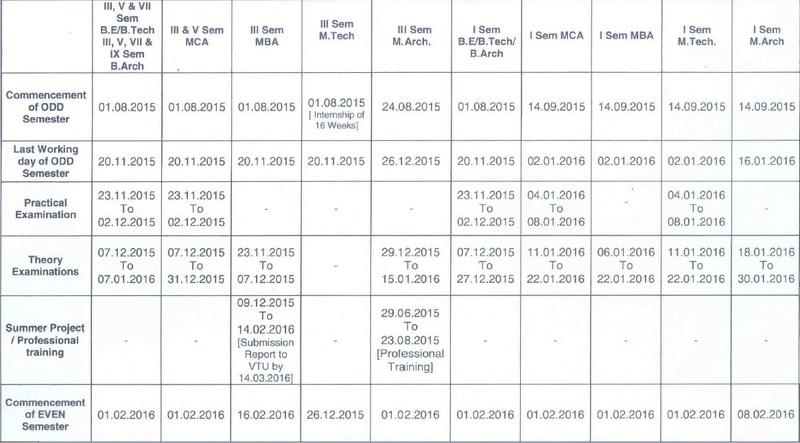 VTU announced time table for December 2015 semester examinations of BE, BTech, MTech, MCA, MBA courses. 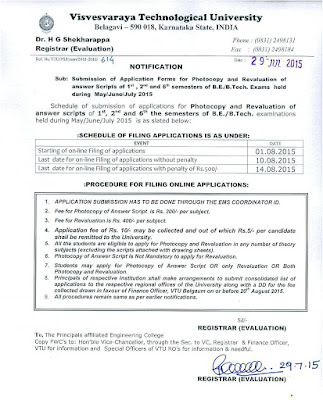 Here is the procedure to get the Provisional Degree Certificate from the VTU by passed out candidates. You can get the certificate through post by sending the required documents to VTU. 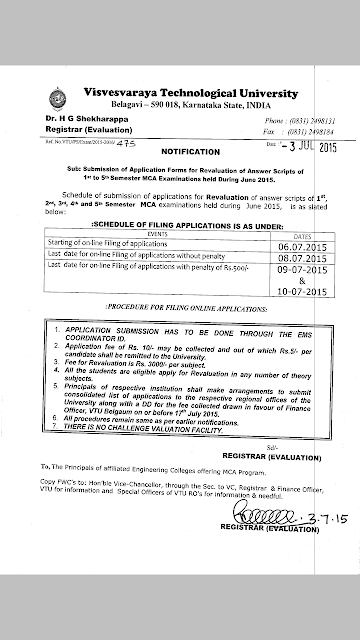 You can download the PDC application form from the VTU website. Click below link for application download. After downloading the application take a print of it and properly fill the form. Go to any one of the nationalized bank and make a DD of prescribed fee amount for the PDC. The fee amount is specified in the above link from where you have downloaded the application. Make the DD in favor of "Finance Officer, VTU, Belagavi". Write your name and USN and contact number behind the original DD. If you pay the fees online remember to take a print copy of payment receipt which will be sent to your email(from payment gateway). 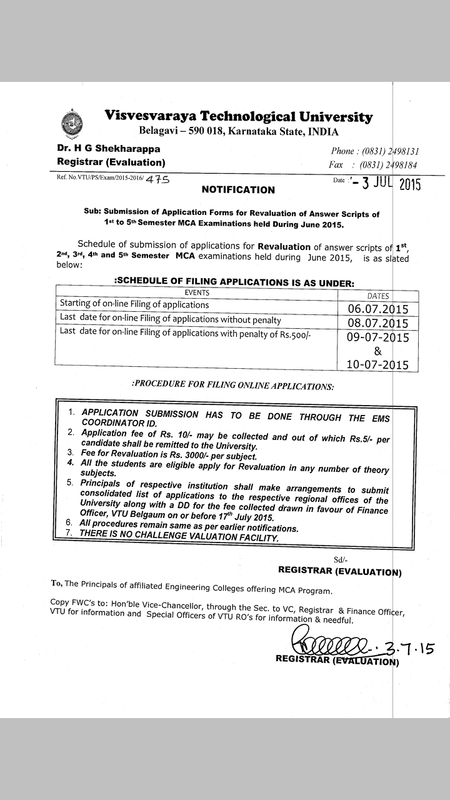 In an A4 letter, write a letter to the Registrar of VTU to provide the PDC. Mention your name, USN, college, Year of passing, your home address, DD number and contact number. Step 4: Put all the documents in A4 envelope and send it to VTU. Buy an A4 size envelope from the market and put all documents in it (PDC application form, DD or fee receipt (if you paid online) and letter). Do not include xerox copies of marks cards. Write this address on the envelope. You will receive your PDC in the next 25-30 working days. The results of B.E 3rd & 5th semester Examination of all Region,conducted during June/July 2015 will be announced today(03-08-2015) after 9.00 p.m.
will be announced today(03-08-2015) after 9.00 p.m. The results VTU B.E. 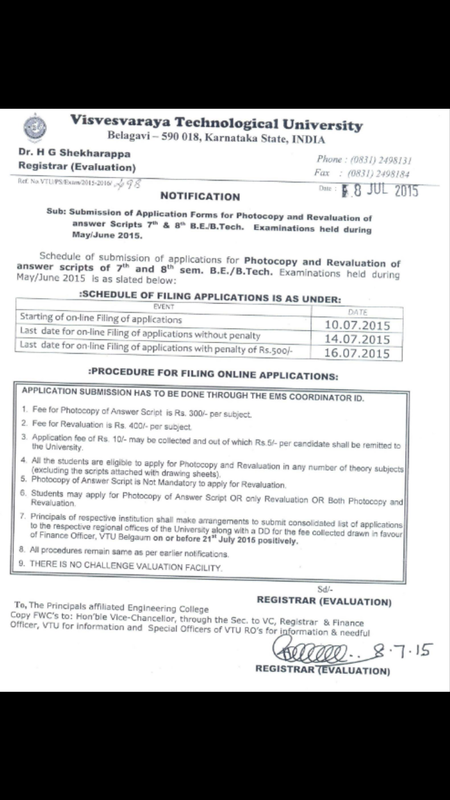 4th semester examination of Bangalore region, conducted during June/July 2015 will be announced on 31st July 2015 after 9.00 p.m. Examinations of all the regions and B.E. 4th sem. 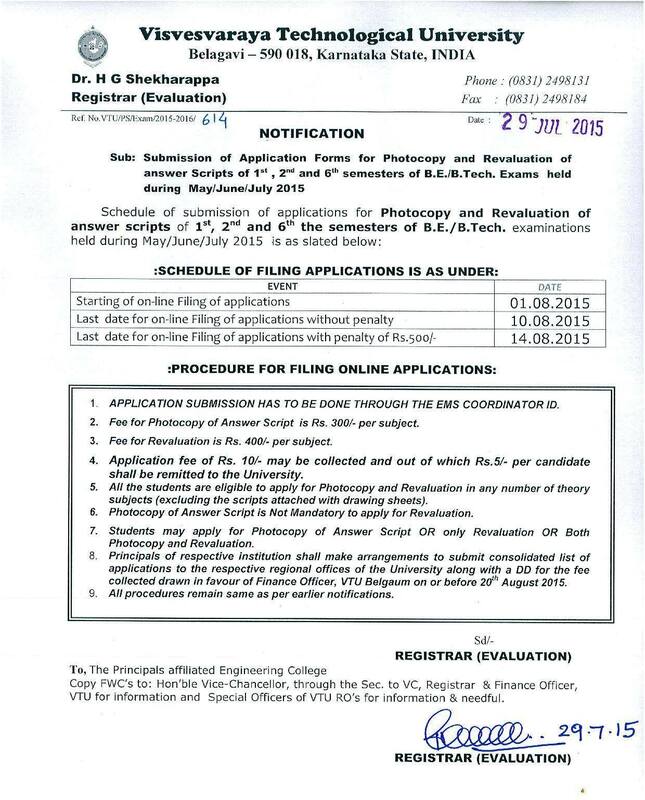 VTU year back system is a concept introduced by the Visvesvaraya Technological University for Bachelor of Engineering(B.E.) that emphasizes certain rules on the examination system. 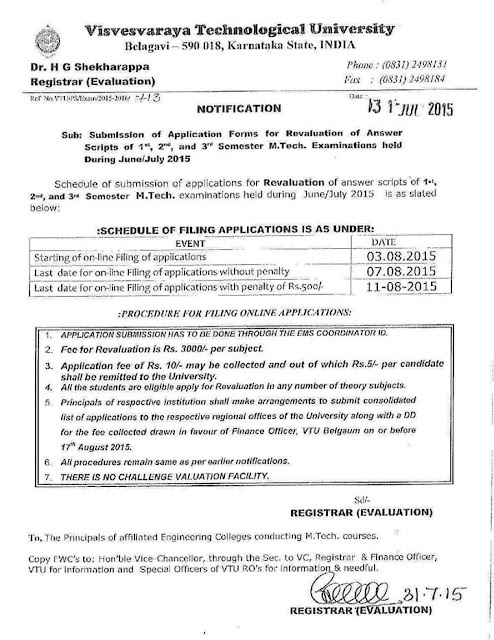 What is VTU year back? 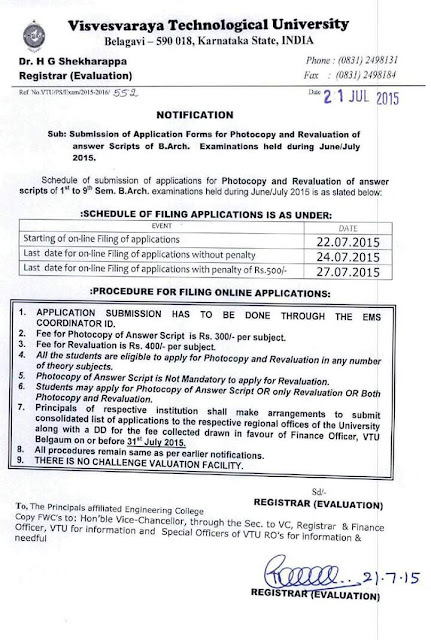 What are VTU year back rules 2015? A year back is a condition that limits the number of subjects a student can carry to the next year. 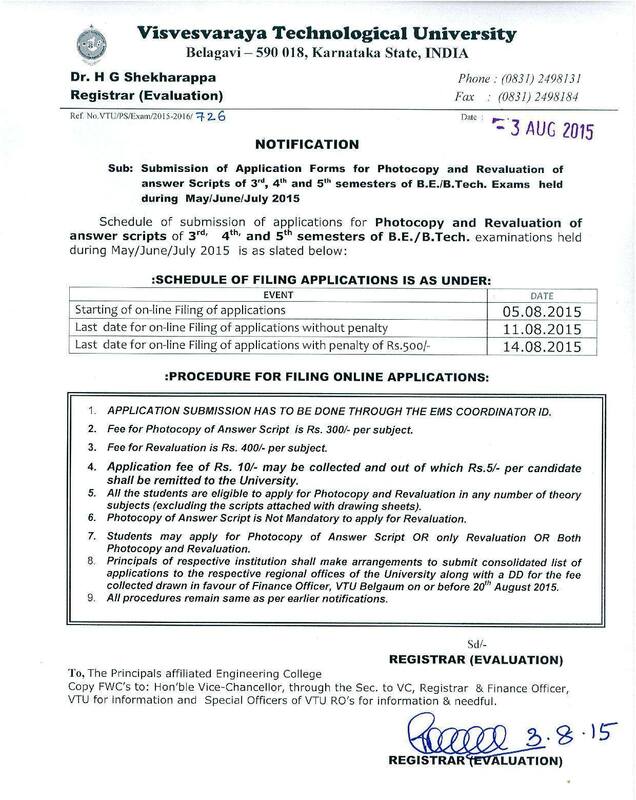 As per the current rules (2015), a VTU student can carry only 4 subjects to the next year. i.e., if a student has more than 4 standing backlogs he/she cannot enter into the next year. One more concept in year back is called critic subject. That is a student must clear the first year subjects to enter into the third year. The 1st year subject which limits a student from entering into the third year is called critic subject. However there are two subjects which are not considered for year back system and critic subjects. What are the subjects which are not considered for year back? Constitution of India & Professional Ethics and Environmental Studies (CIP and CIV) are the 2 subjects that are not considered for year back. However these two subjects must be cleared to get the degree completion certificate. 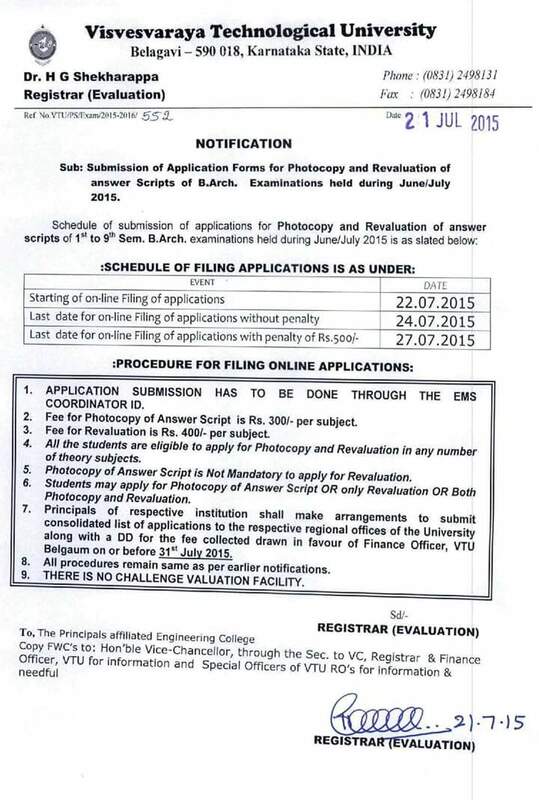 Q: Whether VTU year back system will be there in 2015? Or is it cancelled? A: Yes. As of now year back will be there. It is not cancelled. A student can carry only 4 subjects to the next year. And if you want to enter into third year you must clear all the first year subjects except CIP and CIV. Q: I have 4 backlogs in first year. Can I enter into 2nd year? A: Yes you can enter into 2nd year. Having 4 backlogs is not year back. But if you have more than 4 backlogs it will lead to year back. Q: Whether CIP and CIP are considered for year back or not? A: No. CIP and CIV are not considered for year back. However you must get passed in these subjects if you want to get degree completion certificate after completion of the course. Q: I have 6 backlogs in first year and two of them are CIP and CIV. Whether it is year back? A: No. Since these two subjects are not considered for year back system it is not year back. Q: I have 5 backlogs in first year and one of them is CIP (or CIV). Whether it is year back? A: No it is not year back. Q: I have maths-1, maths-2, electrical, electronics, computer concepts and C programming backlogs in first year. Is it year back? Q: Is there any supplementary exam for yearback? A: No there will not be any supplementary exams. Q: Is there any possibility of cancelling year back? A: As of now there is no news of cancelling year back. Note: Lot of students are opposing the year back system or urging to increase the number of backlogs but there is no news about this. After all it’s VTU’s decision. We will update this post if there is any changes in future. This page is updated frequently. The results of B.E. 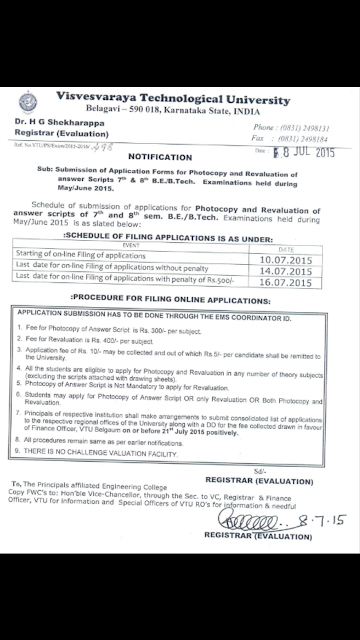 1st and 2nd Semesters Examinations of Belagavi, Kalaburagi and Mysuru Regions, conducted during June/July 2015 will be announced on 22nd July 2015 after 9.00 p.m. Candidates may visit the University website i.e. http://results.vtu.ac.in/, for their results or get the results through SMS to 5424204 and the format for SMS is RESULT(space)USN(space) email-id. www.vtu.ac.in and also in all the colleges. format for SMS is RESULT(space)USN(space) email-id. of Rs.500/- from 25th to 27th July 2015. 3rd July 2015 after 9.00 p.m.
(space)USN(space) email-id send to 5424204. All the best. and also in all the colleges. on 5th July 2015 after 9.00 p.m.
That means may be tomorrow(saturday) or sunday..
We will post if we get any updates..
No VTU results will be declared today. will be declared today after 9PM. And according to VTU remaining regions results will be declared by this week. Results of VTU B.E. 8th Semester Examination of Gulbarga Region held during May /June 2015 will be announced today(29-06-2015) after 9.00 p.m.
(space) email-id send to 5424204. All the best. 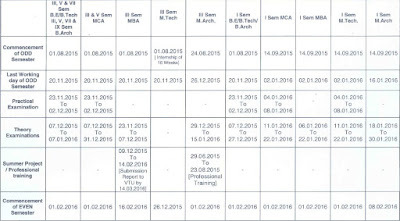 VTU has released academic calendar for the ODD semester in the year 2015-16. If any of the below date is declared to be a holiday then the corresponding event will come into effect on the next working day. Notification regarding calendar of events relating to the conduct of university examinations will be issued by the Registrar.